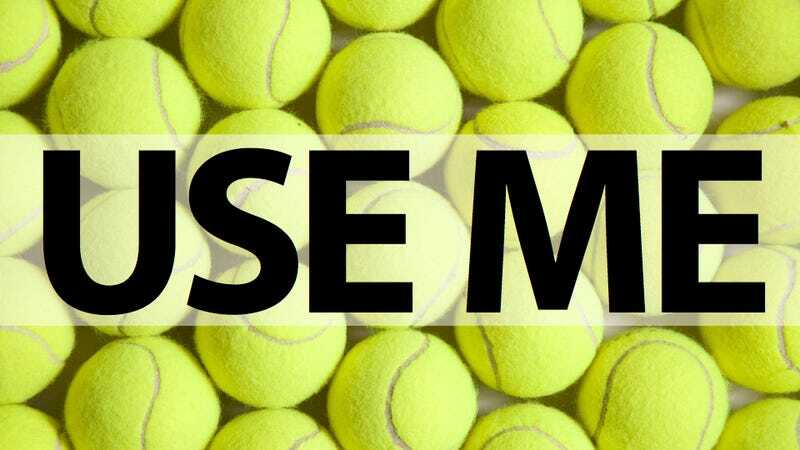 Old tennis balls may not be able to bounce around the court, but they can be incredibly handy around the house. Here are eleven second acts for the Wilsons. Just give the balls a chance. Tape the ball to a string and hang it from the garage ceiling so it touches the driver's side windshield when your vehicle is parked in the ideal spot. Pull forward until you tap it. Cut a small X in the ball with a utility knife. Then stick it on the end of a broom handle. Use it to easily rub off scuff marks on wood or vinyl floors. 3. Put a ball on a pole to wipe cobwebs off ceilings. Fit a drilled ball on a trailer hitch to prevent scratches and rust. Cut open a tennis ball to protect your walls from door handles if the doorstops aren't doing the job. The ball will at least keep the handle from bashing a hole in the drywall. Drop two or three clean balls into the dryer next time you're drying comforters, pillows, towels or jackets. They'll bounce around and collide with the laundry to fluff it up and dry it faster. Cut a slit in a tennis ball and slide it over the business end of a hammer. It'll cushion the face, making a finish-saving mallet to knock stuff into position. Put balls on furniture legs when rearranging it. Stop scratching up the floor. Make it slide. 9. Deck chair legs get stuck between the boards? Give 'em ball shoes. To stop a small child from opening a door, place a ball over its knob. Note on tip five—it works best for door handles you don't need to twist. In Minnesota, kids fill a ball about a quarter full of pennies and use it to practice hockey stick handling off the ice. The pennies make it as hefty as a puck, so it won't go flying when you slap it. Just tape it up thoroughly.